#Movistar – Who Owns Your Customers’ Problems? And after 69 rather long, frustrating and somewhat infuriating days of a much anticipated wait … HABEMUS INTERNET! Yes!! You are reading it right. After nearly 2.5 months of waiting for Movistar to, finally, get their act together, I am now, at long last, properly online through my regular landline and its corresponding ADSL connection. I know this may sound a bit silly and everything, but, boy, I am just such a happy camper. Excited, even, to no end like a young kid in a candy store for the first time not knowing exactly where to start just yet, as I get to witness how 2015 can now begin for yours truly with today as my first official day back at work. Once upon a time, on November 7th 2014, to be more precise, I moved out to a new place, right in the city centre of Playa del Inglés, (Gran Canaria) 3rd largest city in the Canary Islands during high season, thinking that I’d be much better connected to the Internet in order to be able to carry on with my knowledge Web work. Wishful thinking, I suppose. I mean, how naïve can someone be to expect that if you go to a much larger city you are bound to assume to have better, faster, cheaper Internet connection. No, not going to happen. Not likely if the ISP is Movistar. During the course of the following 67 days (Yes! 67 days!) a lot of things happened in the mean time that, if anything, only helped increase my frustration and rage to levels I have never experienced over the course of the last 18 years I have been online and in multiple cities and countries, as I witness how every day that I was not online I kept losing an opportunity to generate some more revenue, resulting, in the long run, to having lost three (potential) clients along the way. If you have been reading this blog for a little while now you may have read already the couple of blog posts I have put together on the topic. This entry is the follow-up one to them all as on the 67th day something happened. I got to talk to a human. For the first time. And it was weird, because he wasn’t even a Movistar employee but a sub-contractor from Montelnor who was basically just as surprised as I was for being the first person I talked to face to face and who pretty much showed up where I live as his boss told him they were running out of time on the complaint I apparently raised (I don’t recall having made such claim in the first place, so probably someone did it for me, after nothing happening for 67 days in a row, who knows…) and therefore they needed to act. And pronto! I was in trouble. Big trouble as he kept explaining how the place where I now live was not wired at all and the telephone box was a complete mess. And it certainly was! I saw it and too bad I didn’t think of taking a picture to see the messy situation of how this particular telco looks into the whole concept around maintenance of infrastructure. Or the lack of, better said. What a real mess! According to this technician’s words I was in trouble, because the place where I now live was not wired and that was beyond his control. Nothing he could do or influence to make the necessary adjustments. The local technical service from the complex where I live needed to patch me up instead, apparently, according to his colourful commentary. Meet Frank. Although not his real name, he is the guy from the technical service. A quick short visit, an explanation of the problem I have, a fast and rather thorough look here and there at where the problem was and off he goes! Bang! On to solving the problem. Next morning, while I was working at a friend’s home stealing, once again, their wifi, so I could meet up a couple of clients I will be visiting this week in Madrid, he shows up with one other technician from the same subcontractor company and before I could blink on my way back home the whole house is fully wired and ready to go! Whoahhh! What a difference owning your customer’s problem makes! The next day, the subcontractor technician who was there the day before worked out the final piece of magic and after a couple of hours fiddling here and there the landline gets installed, and I FINALLY have got an Internet connection. And the nightmare is, at long last, over! 69 long days are now a thing of the past! Yay!! No, wait, DOUBLE yay!! Needless to say that Frank did a superb piece of job (and got a lovely tip as a result of that!) in showing and demonstrating first hand to both the Movistar and Montelnor (the subcontractor company) technicians and customer service / support teams one of the fundamental traits of delivering a delightful client experience, regardless of whom the client may well be: no matter what, as the service provider, you always own your customer’s problem. No exceptions. 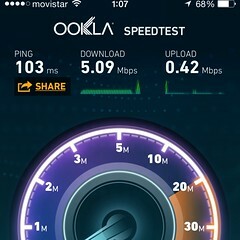 And that is essentially where both Movistar and Montelnor failed big time to deliver. They never even attempted a single time to own my problem (i.e. the transfer of a landline and ADSL from my old home to my new one, never mind the additional services contracted and already paid for, like Fusión, which I am still waiting for it to be completed, by the way!). Yes, I know, I am one of the 22 million customers Movistar has, but it is of no excuse really to make a single customer wait for nearly 2.5 months before having their needs or business problem(s) solved. And that’s what total ownership of your customer’s problems is all about: becoming responsible and accountable for your client’s needs and wants, something that Frank understood really well right from the beginning and who within the course of a single day got everything sorted out. Flawlessly and in a heartbeat and always keeping me in the loop of what was happening so I would know the due progress just as it happened. Why can’t companies that claim to be customer centric get this? Why can’t companies that keep claiming they work really hard on providing excelling client experiences, but fail to deliver, become more accountable and responsible for putting actions behind the (useless) marketing words they utter all over the place time and time again? Plenty of people out there keep saying how we are entering the age of the most personalised, individualised and customised client experiences than ever before, yet it’s got to be Frank, who has been working as technical service for over 35 years, the one who keeps demonstrating on a day to day basis what owning your customer’s problems is all about becoming more customer centric, more accountable and responsible for your work and eventually more human. Why can’t companies become more like Frank? Why can’t companies become more human by showing more empathy and engagement when dealing with their customer’s problems? Why can’t Movistar be one of them? PS. Oh yes, the picture I have shared above, as part of this blog entry, is the actual speed test I did right after I got connected the Web through ADSL and, I know what you may be thinking… gosh, it’s awfully slow for today’s standards, I suppose! Well, yes, it certainly is! But I guess it’s better to have such speeds than having no Internet at all, like I have just gone through for nearly 2.5 months! But it gets better, because once again Movistar failed short on the expectations raised, because when I first moved to this new place I was advised I would be enjoying speeds of up to 10 Mbps download (Not lightning fast either, but a minor improvement!) and instead this is the current speed I’m getting and it won’t go any way further up at this point time at all. So I better get used to it, I was told. The alternative would be rather ugly. Great story, Luis! You evidently had an extremely difficult time without Internet access for so long. My experience is not as bad as yours, but I had more than 4 years in a place with only about 1Mbps and multiple failures. Now I have much more and fibre is available that I have not even subscribed to (yet). You make some interesting comments about mobile access speeds. As I see it, mobile speeds have been increasing faster than landline speeds for quite a long time. 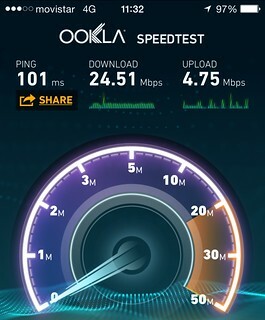 Also some experimental mobile networks are demonstrating extremely high speeds. So it not very surprising that mobile has overtaken landline in some areas and will do so in others. You might find that your landline never catches up with your mobile in terms of speed. I suspect that before too long, depending on pricing, many people will drop the use of land lines and rely entirely on mobile, as many people are already doing for telephones. An interesting topic and it’s great to read about your experience. Hi John, many thanks for the lovely feedback and the wonderful comments! Yes, it’s been quite challenging and something I wouldn’t even recommend to my worst enemy 😉 In all honesty, I am now glad things have been fixed and so far the experience has been flawless. It was just that bumpy start that took me down for so long that was the most frustrating. But hopefully that’s a thing in the long gone past to never return again! I think I am going to disagree with your commentary about the mobile speeds and everything. Yes, they are going to increase more and more over time. Currently, for myself, it’s 3 times faster than my ADSL, but there is a single item that still makes my landline connection worth while having: unlimited bandwidth. With my current mobile provider, which is the same as my ADSL provider, I have got a limit of 2GB per month, for which I’m paying a substantial amount of ‘extra’ money, whereas with my ADSL line, yes, the speeds are lower, but the unlimited bandwidth makes it worthwhile. I’d say that till mobile providers don’t get their act together and break those silly quota limits per month ADSL landlines will still be here for a long while, I am afraid. I once tried to rely on those 2GB, which I then upgraded to 5GB per month, and it lasted me 2 working days. I am really sorry to say this, but fully relying on your mobile and 3g / 4g for data is not there just yet. At least, over here in Spain, where I live. Hoping that will change some time really soon! Again, thanks for the kind feedback and for adding further up into the conversation! Much appreciated.